The arrival of a new year also implies the setting of new challenges in all areas of our lives. 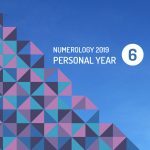 Thanks to this discipline, it is also possible to determine with Numerology 2019, personal year 6, according to various aspects or principles, how our year will pass according to the numerical combination also known as Numerological Natal Map. The number 6 is considered as that of love and kindness. They do not look for protagonisms or to be the center of attention, they prefer to go unnoticed. Over time, they develop protective skills towards their environment that makes them be true treasures as friends. They can also be unpredictable, even becoming very different from what they normally are. In the labor field, they are strong and direct and have no fear to express their points of view. With number six there are no intermediaries, on the contrary they are extreme. Either they are extremely optimistic or they end up being pessimistic. What is impossible to ignore is that they are generous people with the capacity to give good advice. That is why they often works as diplomats, advisors or lawyers to put all their talents at the service of others. By 2019, avoid indecision. Make a plan of action and then act without remorse. You will not be able to avoid responsibilities because it will always be a period of facing life without fear. The number 6 must, at all times, honor their word and keep the promises they make. Only in this way can they be respected. Precisely because of their family nature, they will be present and kind. The rest of personal spheres… well, it will depend on their stability. Bur remember: there can be no darkness in the house and light in the street. You should not forget that everything related to people is changing and you cannot be so hard when judging their behavior. Focus on people and not on their mistakes; tomorrow it may be you. What 2018 was like for number 6? The year 2018 promised to be extremely calm for number 6. After the storm came the quietness and with it the opportunity to have peace to analyze and think about what is to come. The bridges of communication within the couple were also consolidated to the point of improving considerably the romantic relations and the coexistence. This number is known as the maternity number. It is said that no family can remain united without the intervention of number 6 – it is the one who unifies the family environment and on which the future is built.